All buildings must develop, implement and adopt emergency plans to ensure a safe environment for employees, residents and visitors. When developing these plans the needs of people with disabilities must be considered. Ideally, all visitors should be able to independently evacuate from a level of a building, other than the entry level by way of an evacuation lift. However, it is acknowledged that buildings may not have been constructed to provide this level of accessibility in evacuation routes. Where a person might have difficulty negotiating an exit route (i.e. using a fire stairs), each building must implement some management controls to provide for people with disability. Fire wardens should keep a list of people with disability including staff, people visiting the building and record where they are going. This could also be managed by building security or management. Personal Emergency Evacuation Plans, or PEEPs should be prepared for people with a disability. General Emergency Evacuation Plans should be prepared that consider the needs of all people with a disability visiting the building. Consideration should be given to providing equipment or adopting methods to alert visitors with hearing impairment of any building alarm during an emergency evacuation or evacuation rehearsal, such as pagers, visual alarms or displays, or SMS notification. If an evacuation lift is not provided each level should have a designated area where a person with mobility limitations can safely wait for help during an evacuation. Each space for a person using a wheelchair should be at least 800mm x 1300mm and away from the path to the exit doors or exit stair. Ideally, each area should have accessible signage identifying the area and a communication, intercom or phone within the area for communicating with emergency services personnel. Where there is a high number of building occupants on a level of a building the number of spaces must be increased. Evacuation Chairs are compact and foldable mobile chairs used to evacuate people with a disability down stairs. The chairs have wheels and rubber tracks which allow for a controlled decent down stairs. Generally evacuation chairs have speed regulation devices and braking systems that control the speed of descent and have an additional brake when stationary. Evacuation Chairs are normally operated by one person. However, some models allow for 2 people to evacuate a person up stairs. Evacuation Chairs are particularly important for those persons who have mobility limitations. They are particularly useful for people who are wheelchair dependent, where in the event of an emergency are unable to use a lift and are unable to exit the building via the stairs. The evacuation chairs should be provided in the waiting area with suitable signage advising of their availability and use in emergencies. In the event of fire, deaf or hard of hearing people will not be able to hear the fire alarm whilst sleeping. A vibrating device provides a wire free solution for communicating the sounding of a fire alarm to deaf and hard of hearing people when they are asleep. When the building alarms sound the device senses the sound level and triggers the vibrating pad placed under the pillow. Exit doors that have an exit light over the doorway should also be provided a Braille and tactile sign installed in addition. These signs need to be installed at an accessible height. Exit door and exit paths from public spaces must also be clearly visible. An emergency escape mask or smoke hood is a device that is worn over the head in the event of an emergency. It can protect individuals from toxic smoke and fumes for an effective duration of up to 60 minutes. They allow the wearer to breathe air that is free of smoke and toxins while they exit from the danger. 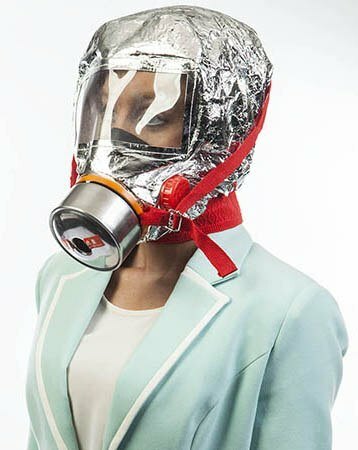 While wearing the emergency escape mask or smoke hood a person can assist others to exit during an emergency evacuation if it is safe to do so, without the risk of inhaling toxic fumes.